need to load new Web pages based on user choices. Dynamic Web pages may also be used to temporarily display information, such as a block of help information, a calendar with clickable dates used to assist date entry fields, airport codes, and other information. This information may be stored by using a series of stacked layers (using the cascading styles z-index property) in the Web page design, each on top of another. The main Web page is the base plane, the standard layer of the Web page that displays or obtains information, while others below the page are not visible. What events cause the layer to be created? These include a user clicking or tabbing into a field, clicking a link, or counting the number of keystrokes entered into a field. An example would be a hotel chain with many locations. To include all the locations in a drop-down list would make the list too long. When the user enters three characters, a block surfaces listing hotels starting with those three letters, including the country, city, state or province, and other information. If the event was detecting only two letters, the list may be too large for the display block. What events remove the layer, such as a close button, clicking a date, clicking outside the region, or selecting a hotel from the list? Where should the surfaced block be placed? Typically next to the field that created the block, in x- and y-coordinates. How large should the block be, measured in pixels? If the information is too large for the block, such as a list of hotels, the analyst should decide how to handle the additional information. Options include adding scroll bars or positioning a link at the bottom to the next page of information. What should the region formatting attributes, such as color and border, be? If there is a series of links, review their appearance with the users. Ask the users if they would like the color to change as the mouse moves over each row. What should happen when an option is selected? In the case of a reservation calendar, when a date is clicked, the date is placed in the starting date. If a hotel is selected, the city, state or province, and country information, along with a link to the hotel, should populate the Web form fields. Using layers is an effective way to build Web sites since it does not require any pop-up pages (which may be blocked by Internet security software). Additionally, a new Web page does not have to load, and, because the information is contained in a layer, it does not take up any space on the main Web page. 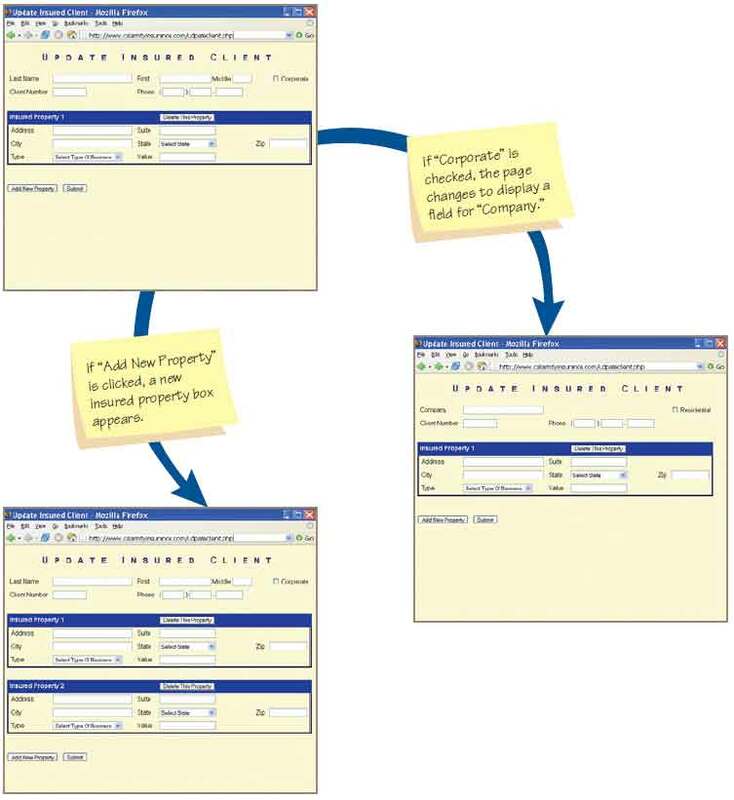 Figure illustrated below is an example of a Web form used by an insurance company to change client information; to add a new location for a client, such as a new store or restaurant for an existing client; or to remove a store for the client. If the Corporate check box is checked, the Last Name, First Name, and Middle are changed to a Company name field, with the caption text changing as well. If the Add New Property button is clicked, a new set of fields for the third property is added. Care must be taken to generate unique names that the server will recognize for the additional fields. When the form is submitted, the server updates the database tables for the additional fields. 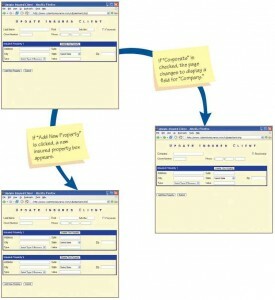 An example of a dynamic Web page from an insurance company. If a user clicks on “Add New Property,” a new insured property box appears. The analyst must decide when the use of dynamic Web pages is appropriate. If the data change when other parts of the Web page change (such as clicking a radio button or selecting an item from a drop-down list), it may be good policy to design the Web pages as a dynamic form. If, however, some parts of the Web form are unsecured and other parts require encryption, it is probably best not to use dynamic forms. A second disadvantage when using dynamic Web pages is that they may not be compliant with the American Disabilities Act.